My idea behind the iPad Manual is to act as an easy to understand reference tool for you to use your iPad in a more productive and straightforward way. Lots of video's are purposely included to illustrate ways you can use your iPad better. I think gestures such as swiping and pinches, for example, are explained more easily in a video than with lots of descriptive words. 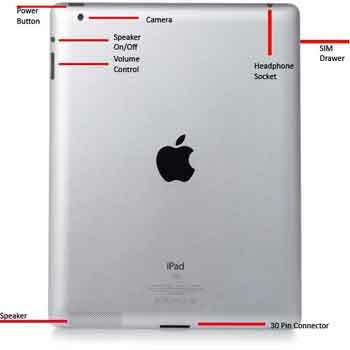 The iPad Manual is grouped together in to manageable chunks so you can easily digest the information presented. I want you to be able to use your iPad painlessly and without the frustration that comes with using new technology. Using devices without a keyboard and mouse take a bit of getting use to. Make this page your first steps in your learning quest! The iPad Manual is the second of a 6-part series on the Apple iPad. Starting with the iPad Revolution, we look at the history of the device, the false starts introducing tablet computers in to mainstream computing, and the impact they have on all our lives. Find My iPad shows you how to locate your iPad if you ever lose it. The technique is easy, and could save you hundreds of pounds or dollars buying a replacement. iPad Updates walks you through the process of keeping your iPad's iOS up to date (applicable to iOS 7). In September 2014 Apple released iOS8. Read through the dedicated tutorial and see, although the steps are subtly different, the update process is broadly the same. Do you know something about the iPad not covered on this page? Share your hints and tips by adding a Facebook Comment. Take a look at other visitors Facebook Comments. You may find an answer to your query, or learn something new. The modern iPad comes with various buttons and ports located on the front and sides. Do you know what they do? All of them? Below are two pictures. One of the front of your iPad, and one of the back. I have highlighted each button and port, and included a description of what each is and what they do under each picture. The above information is based on the iPad2. Other models will vary, (have more or less buttons), but the basic functionality is unlikely to be very different. 3. Switch your iPad back on. Your issue should be fixed! It is uncommon for this action to affect data on your iPad! Use at your own risk. If this doesn't work on your iPad model search for how to do it online. The answer is out there! Now you are aware of the iPad buttons and their use, the next section of the iPad Manual focuses on interaction with your device. The next section of your iPad Manual is Interaction. 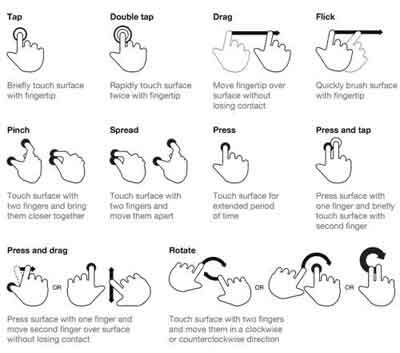 This is a collection of basic hand and finger movements that enable you to use your device productively. There are loads of these 'gestures' - too many to list here. However what I have pulled together is an image depicting the different types of gestures you can perform on your iPad. Most are basic, some a more complex but easy to learn! Multitasking is how you can use your iPad when multiple applications are running at the same time. Just like on a PC or Laptop you can easily switch to different applications. I have pulled together some online video's demonstrating multitasking in practice. I believe video is the best way to show you both interaction and multitasking, and there are many readily available online. I think the short video's below are an excellent introduction to both basic and some advanced features. Enjoy! The basic interactions highlighted above enables most beginners to use the iPad on a daily basis. However there are some very useful multitasking gestues that once you learn them, you'll wonder how you managed without knowing them! To illustrate this I have sourced three excellent YouTube video's. They are only a few minutes in duration but packed with lots of information I think you will find very useful. Enjoy! Are you reading a very long web page? Are you getting Repetitive Strain Injury (RSI) from dragging all the way back up to the hop of the page to use the menu? Simply tap the black border at the top of the screen just above the digital clock, and your iPad will automatically scroll back to the top of the page for you. I hope you found this section useful. There are other interactions such as editing/highlighting text, copy and paste, and how to accept/reject suggested spelling of words when writing documents or notes. At the end of this iPad Manual there is a link to an excellent course I recommend anyone who is serious about their iPad to take. More on this later! Next we look at some of the key settings you need to know about to secure your device and connect to your home broadband. This section of the iPad Manual is split in to 2 sub-sections: Passcode setup and Wi-Fi connectivity. iPads are expensive and are subject to theft and other malicious activity by the scum that walk our streets. There are 2 forms of security for your device. Physical Security is common sense! Your device is valuable and may store private information. Therefore do not leave it in your car or on public transport. Lock your iPad away securely when not in use. This is particularly important when using in a public place. Digital security comes in the form of a passcode, and more recently, biometrics. This is secure access to your information and applications. Your pass code should only be known to you. Remember it! Do not write it down or give to anybody else. Enter your current Passcode. Tap Done. Change your passcode regularly. Ensure it is unique and cannot be guessed easily. Don't use your date of birth. Keep your passcode to yourself and don't write it down anywhere! You have the option of setting a complex passcode. 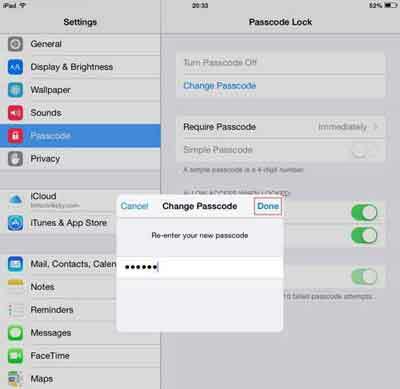 This makes your iPad more difficult to access by increasing the number of characters that make up your passcode. To do this swipe the Simple Passcode option off. Tap the Change Passcode option and enter your current passcode. The iOS classes this as your old passcode. Tap Next when ready. Enter your new passcode and tap Next when ready. 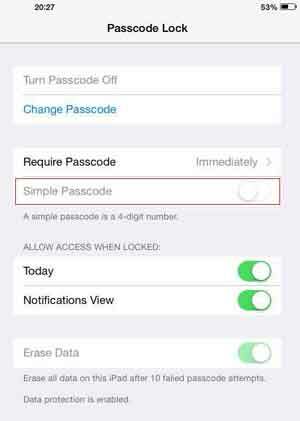 Re-Enter your new Passcode and tap Done when ready. Your device is very limited unless it is connected to the Internet. Web browsing or using many of your apps is restricted without it! Connectivity to the outside world is provided either through your 3G/4G provider or via WiFi. This could be in your home or somewhere like a coffee house with hotspot coverage or free WiFi for customers. Hotspots and Public Networks are NOT secure. All other users of these networks could access information you are transmitting. DO NOT use these networks for things like Internet banking or purchasing items using credit cards on line. It is simply not worth the risk! 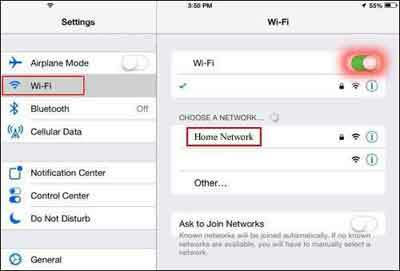 Tap Settings > Wi-Fi, then swipe the Wi-Fi option on the right hand side on. Next tap the network you want to join. Enter your Wireless Password (or Username/Password if required). Tap Join to connect to your network. When you are in range your iPad automatically connects to your known networks. Do not underestimate how important keeping your iPad safe and secure is! Particularly when connecting to public WiFi networks. I tend not to use public networks when I am on my iPad. Whatever needs doing can wait until I get home. Next our iPad Manual focuses on Applications. There are thousands upon thousands on iPad applications available for you to download. Whether they are free or cost to purchase, applications require managing to keep your device running smoothly. Most software packages, whether they are written for the iPad, iPhone or a computer, are updated regularly by the publisher or programmer. These updates are usually to introduce new features or to fix bugs. 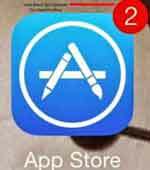 I aim to update my apps on a weekly basis, unless I get to know of any urgent updates because of security risks. In this case I update immediately. There are several key actions for managing your apps which are excellently demonstrated in the video below. As mentioned earlier in this iPad Manual, some actions are better explained via video rather than long-winded text and pictures. The final thing to mention in this section of the iPad Manual is most apps have settings you can (and should) change. 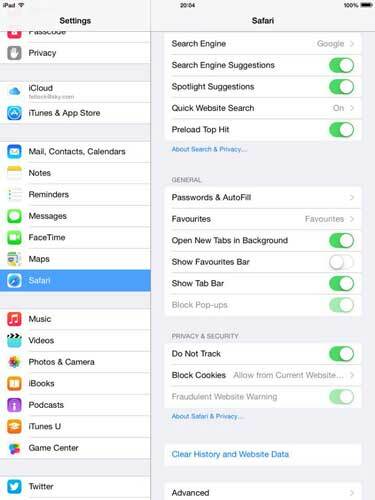 For example, tap Settings then Safari. Here you can set your preferred search engine, block pop-ups and enable fraudulent website warnings. Apple iPads and next generation Tablet devices are going to be around for a while. 2013 showed the biggest drop in worldwide sales of the Personal Computer - a sign of how computing is moving forward! There is so much more to using an iPad than what can be described here. However, to round up the iPad Manual, I have pulled together a list of resources I think are useful to continue your learning. The first resource to mention is the KikStart for iPad (Opens New Window) course from The Chartered Institute for IT (Formerly the British Computer Society - BCS). This course takes you through the basics of how to use an iPad and following a test gives you a formal qualification and certificate demonstrating your competence. The BCS also have a Youtube Playlist (Opens New Window) with several short video's demonstrating numerous hints and tips. Finally I have included another excellent tutorial from H2TechVideos which provides an excellent review of iOS 8. I even found out how to close applications in iOS 8 after watching this video. I have been trying to find out how to do that for ages! 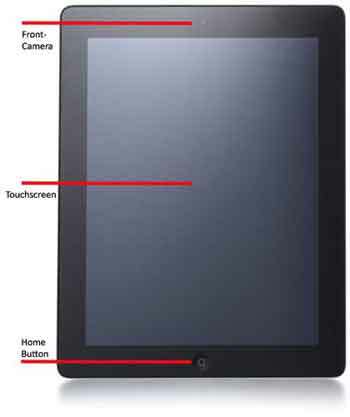 I sincerely hope you picked up something useful from this iPad Manual. I have, and I'm the author! Remember to leave your Facebook comments below.